During the summer, The Daily Herd is highlighting some of the past year’s favorite stories. One WPI professor finds her inspiration—and a new avenue to advance her own learning—at the intersection of her interests. 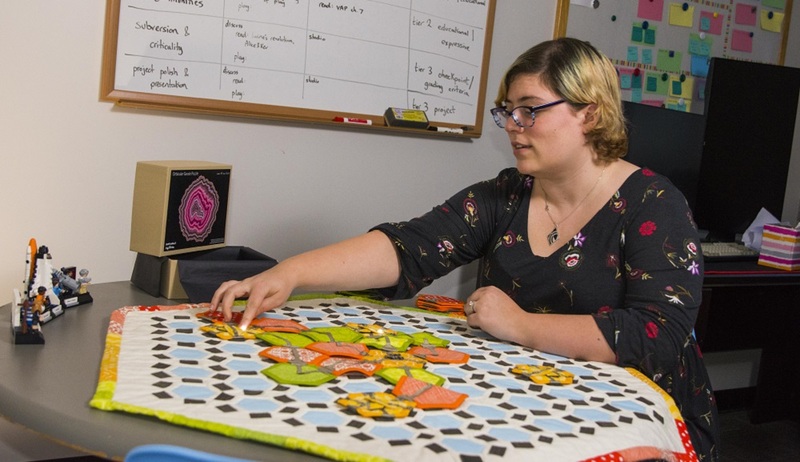 Gillian Smith, assistant professor of computer science at WPI, is combining two of her passions—gaming and crafts. It might sound like an odd combination, but it’s one that is expanding her view of both fields and helping her entwine the real and the virtual worlds. An LED light in Smith's work. Smith, who did some jewelry beading when she was younger, turned to crafts to relax when she was doing postgraduate work and felt like she was spending so much time in front of a screen. Things like quilting and embroidery gave her a different kind of outlet. Then she began to think about how she could mix her two interests together, so she began working on projects like building algorithms that use crowdsourced databases of color pallets and generate original embroidery patterns that she then uses to do her own stitching. “I was suddenly making crafts that I never would have made without the software that created the designs,” she recalls. “The action of making the software pushed the boundaries of making the craft. The act of creating the craft—as I’m spending hours stitching it—has changed how I think about algorithms and code. Crafting, says Smith, could become a new entry point for people to become interested in computer science and digital gaming. It’s another way to draw in women, for instance, who might enjoy creating art but hadn’t considered technology. Smith’s work has gone on to integrate research into artificial intelligence, gaming, and human computer interaction with art forms like embroidery and quilting. An award-winning game designer, Smith co-created eBee, a quilt-based game that teaches the basic principles of circuits. Players create working circuits out of quilted pieces that use regular quilting material, conductive fabric, conductive Velcro, batteries, and LED lights. In the game, players—working competitively or cooperatively—try to create as many circuits, turning on as many lights, as possible. Players receive points for the number of lights they can turn on. While Smith has taught courses on artificial intelligence in gaming and interactive media, she’ll be teaching a class on games for social good in C-Term, and in 2018 she’s slated to teach a course on novel interfaces for games, which will use crafts. She’s also expected to teach a course on human-computer interaction, which will use gaming and crafting.